Jamie Fullarton at the Shay Stadium. 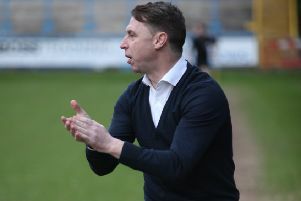 FC Halifax Town boss Jamie Fullarton met with supporters during an event at The Shay this morning (Wednesday). He attended a coffee morning where fans could chat to the manager and purchase a season ticket. The club have sold around 430 season tickets so far, with The Shaymen starting their campaign at Braintree on Saturday. You can read an interview with Fullarton along with all the build-up to the 2018-19 season in Friday’s Courier.